If we need to debug fast running arduino code we might only want to trace exceptions or conditions within a certain range. Visual Micro allows any expression to be used as an arduino breakpoint condition. 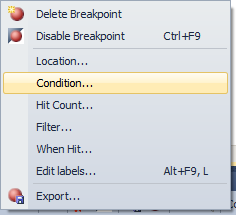 To add a debug conditon to an arduino breakpoint we can use the right menu menu to select the breakpoint options menu. it is also possible to set a "Hit Count" allowing a tracepoint to be reported every x times that it is executed (hit) by the arduino cpu. The example below shows an arduino debugger tracepoint that reports when a random number of between 0 and 2000 has a value between 1000 and 1500. 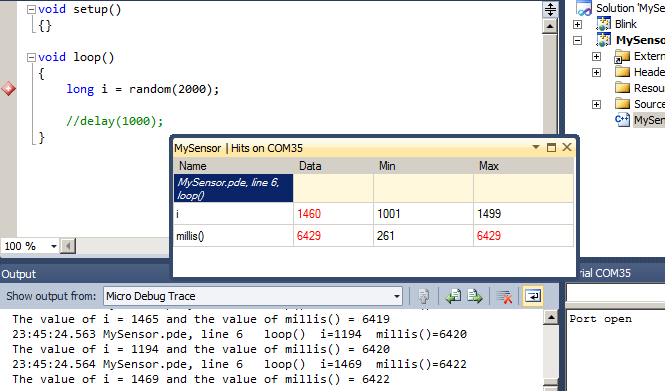 The debugger tracepoint reports the value of i and also the value of the Arduino millis() (milliseconds since startup). "Is True" or "Has Changed" may be used to distinguish between the type of condition that is required. In each case the expression entered must either return boolean true/false or a value. The example below uses the "Is True" condition to ensure the value of i is within the given range. The image below shows this conditional tracepoint when an arduino is running in debug mode. Notice the variables viewer displays both variable and expression along with min and max values. In the example below the min and max values of the condition have already been reached. Items in red show data that has changed since the last point was hit.